Espoo is the second largest city and municipality in Finland. Change things up with these side-trips from Espoo: Haemeenlinna (Hame Castle & Aulanko). 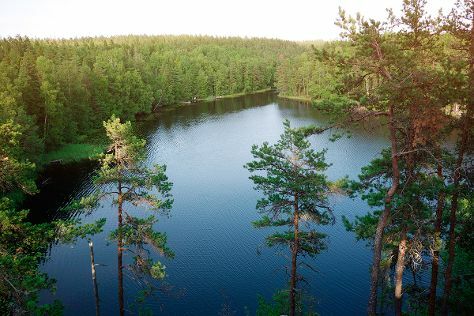 Spend the 5th (Fri) exploring nature at Nuuksio National Park. Plan for a day of cool, family-friendly fun on the 7th (Sun) at Serena Water Park. The adventure continues: explore the world behind art at EMMA - Espoo Museum of Modern Art, contemplate the waterfront views at Kaitalampi, take in the spiritual surroundings of Espoo Cathedral, and explore the galleries of Hvittrask. Start your trip to Espoo by creating a personalized itinerary on Inspirock. If you are flying in from South Korea, the closest major airport is Helsinki Vantaa Airport. Expect a daytime high around 26°C in July, and nighttime lows around 14°C. Wrap up your sightseeing on the 8th (Mon) early enough to travel back home.